In 1947, when the War of Independence was raging in Jerusalem, a single shell struck a house on Nablus Road, north of the Old City. It smashed the entrance door and when the owner of the home, the photographer and Swedish consul in Jerusalem, Lars (Lewis) Larsson, came home, he found that his greatest treasure had been looted — his private photo collection. Other photo collections also later mysteriously disappeared from Jerusalem — the large collection of brothers Najib and Gamil Albina and that of photographer Lars Lind, who like Larsson were members of Jerusalem’s American Colony. These losses, along with political and personal conflicts, led to the disappearance of much of the most important photographic archive in the history of Jerusalem and the whole country: the collection of the American Colony Photo-Dept. 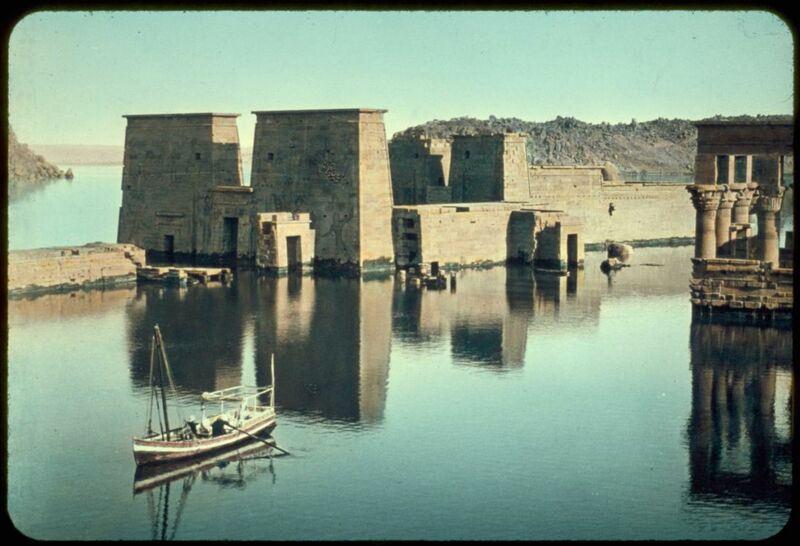 Since 1966, some of the archive has been discovered and published in Israel, the United States, Sweden and other countries, but the location of many of the photographs is still unknown. For the past 12 years, Rachel Lev, curator of the American Colony archive collections, has been trying to piece together the fate of the photographs and make order in this unique and valuable cultural asset. Recently, she found another important part of the puzzle: Although Larsson left the colony’s photography department in 1930 and lost most of his collection when his home was broken into in the late 1940s, she managed to reassemble an important part of his collection, only to discover that it wasn’t created only by Larsson. Over the years, the colony’s photographers sent their pictures to a London press agent named Harold Shepstone. In the 1950s, after the collection was lost, Larsson asked his son, Theo, to turn to Shepstone in an attempt to reconstruct some of the lost photographs. 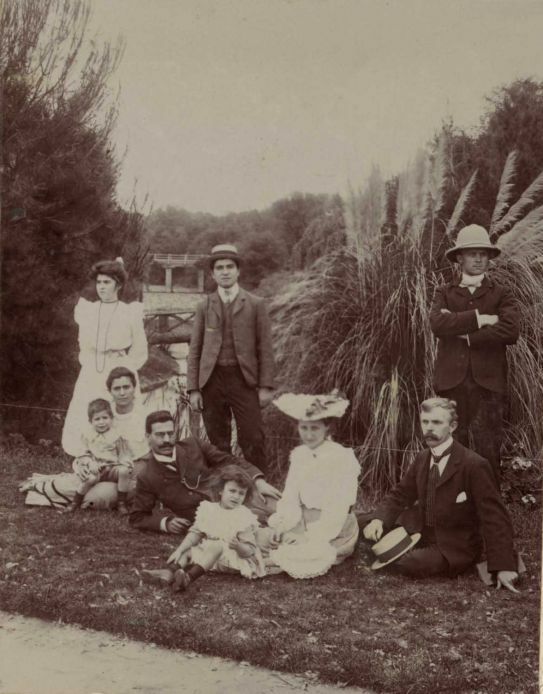 Theo spent several days in Shepstone’s attic in London, and returned to his father with 600 photographs, some created by the American Colony Photo-Dept. photographers and some to the Matson Photo Service that belonged to Eric Matson, who gained control of the department once it was disbanded. Larsson went through the photos and wrote on their backs the details he knew about their origin. The American Colony is known as a prestigious boutique hotel in East Jerusalem, a meeting place for journalists, diplomats and politicians from Israel, Palestine and abroad. The historic structure belonged to a group of Protestant utopian Christians from the United States who settled in the Old City in the 19th century. The turning point for the group came when 120 new members, most of them Swedes, joined them in 1898. 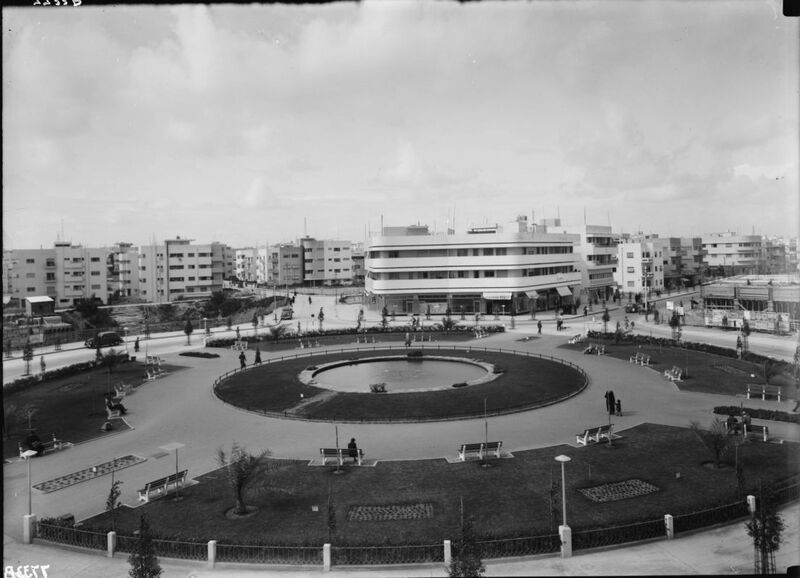 That’s when the large building now the American Colony Hotel — located in the Sheikh Jarrah neighborhood — was rented and the members of the group took up photography. The colony’s photography department was first associated with two carpenters. The first, Ferdinand Ludwig Vester, was a master carpenter who had a shop on Jaffa Road, one of the first places where the photos were sold at the end of the 19th century. The second, Elijah Meyers, was a Jewish convert to Christianity from Bombay, who was struck with Jerusalem Syndrome. “He would wear a huge turban and a silk cloak, and he believed he was the reincarnation of Elijah,” Lev says. As the group grew, they sought new businesses. Vester, whose son joined the group, suggested they open a photography business. Meyers, who was also a talented self-taught photographer, began to teach photography to the colony’s young men. 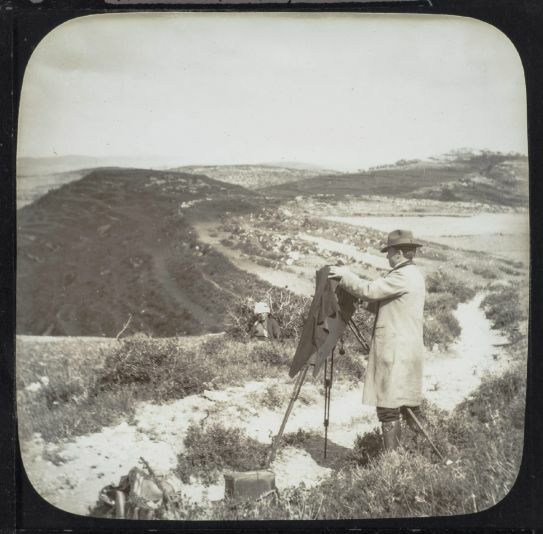 In less than two years, the young photographers got the chance to prove themselves during German Kaiser Wilhelm II’s historic visit to Jerusalem. The photos of the imperial visit became famous worldwide, as did the new American Colony Photo-Dept. In the years that followed, American Colony photographers became the most methodical and expert in their profession anywhere in the Middle East. The approximately 15 photographers took journalistic and documentary shots as well as artistic, scientific and tourist photos. 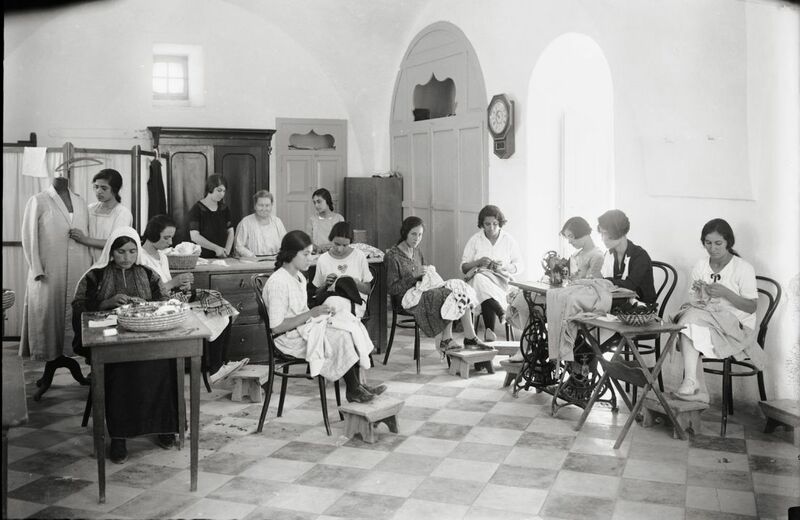 In the archive are pictures of daily life in the colony alongside events from World War I. For example, in 1917, Larsson accompanied Jerusalem’s Mayor Hussein al Husseini on his famous search for a British officer to whom he could surrender the city. The colony’s photographers also documented the bloodshed between the city’s Jews and Arabs as well as the leaders of the Zionist movement alongside the mufti, Emir Abdallah of Transjordan and the heads of the British administration. The collection also contains careful scientific documentation of the country’s flora and fauna, which are used to this day for research abroad. The best-known of these is a hand-colored close-up of the life cycle of the locusts that attacked the country in 1915. 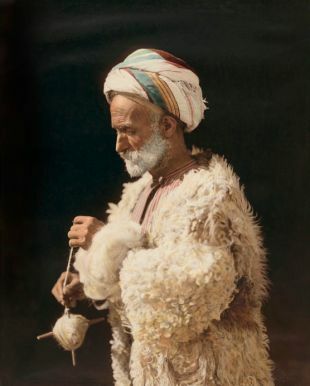 The colony’s photographers also highlighted the people of the country, sometimes in staged scenes meant to evoke the biblical and Orientalist tropes popular at the time. They perfected the technique of expert hand-coloring that created spectacular color pictures combining photo and painting. 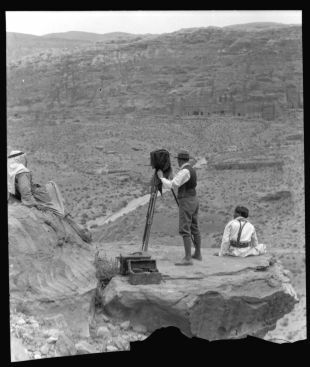 Unfortunately for curators and researchers, most of the photographs were signed by the collective “American Colony Photo Department,” making it virtually impossible now to reconstruct which of the photographers took which shots or series of shots. The photo department remained in operation until 1930, when some of the members left, including department head Larsson, who purchased a house not far from the American Colony and continued his photography career while serving as the Swedish consul. No one knows how many photos made up the original collection. 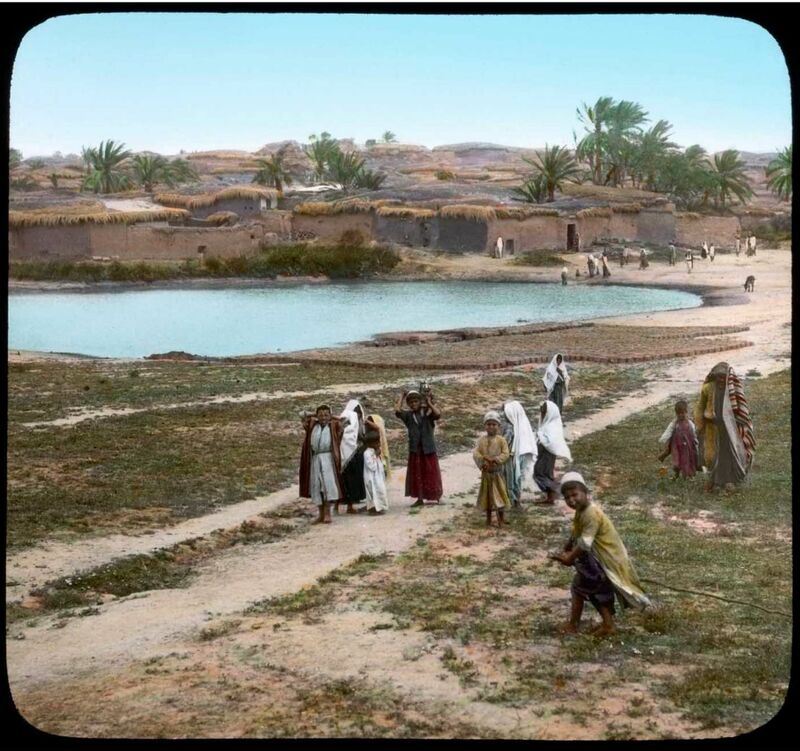 Lev points out a 1905 letter from Larsson in which he wrote that during a two-month visit to Egypt he photographed more than 800 glass negatives. It may be assumed that the original collection, created by 15 photographers over more than 34 years, was much larger than what we know of today. 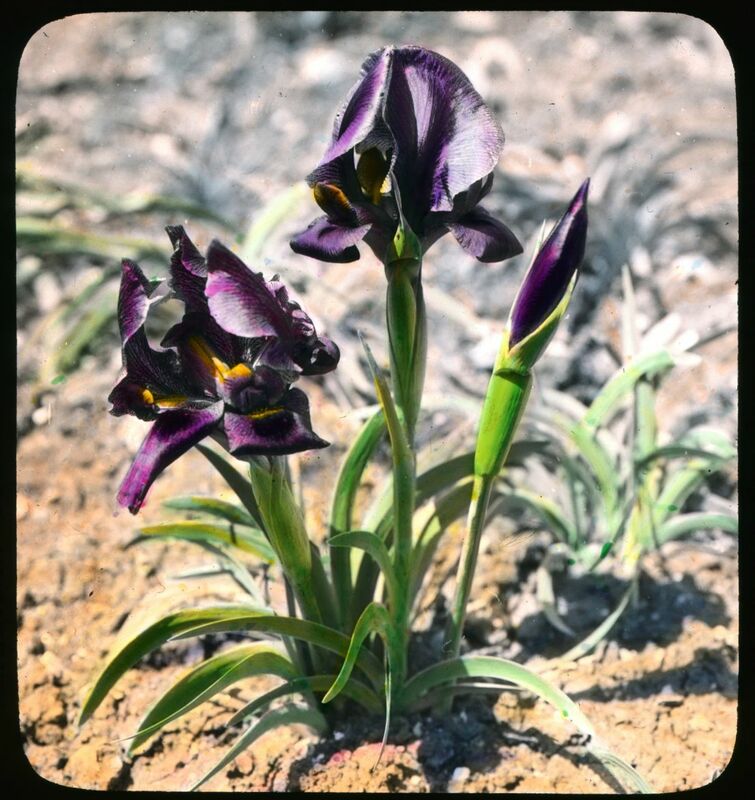 The best-known collection is the Eric and Edith Matson collection in the U.S. Library of Congress, which has been digitalized and is available for free use on the Library of Congress website. The Matsons were among the colony’s photographers. In 1930, a few years after the death of the unopposed leader of the colony, Anna Spafford, the group splintered. Many of the photographers left, including Larsson. The Matsons remained in the colony and continued photographing until 1934, when they also left. In the property division agreement between the Matsons and the Colony, they received the photo archive, including the glass negatives. The rare photo-album collection remained with the Colony and is publicly available for view in the American Colony Archive, in Jerusalem. After Eric Matson received the collection, he began publishing many of the photos, sometimes with a stamp indicating he was the photographer. In 1939, after protest by his former partners in the Colony, he was asked not to use the trademark name of the American Colony Photo Department and he changed the name of the studio to the Matson Photo Service. In 1946, the year before Larsson’s house was bombarded and looted, the Matsons left the country for the United States. 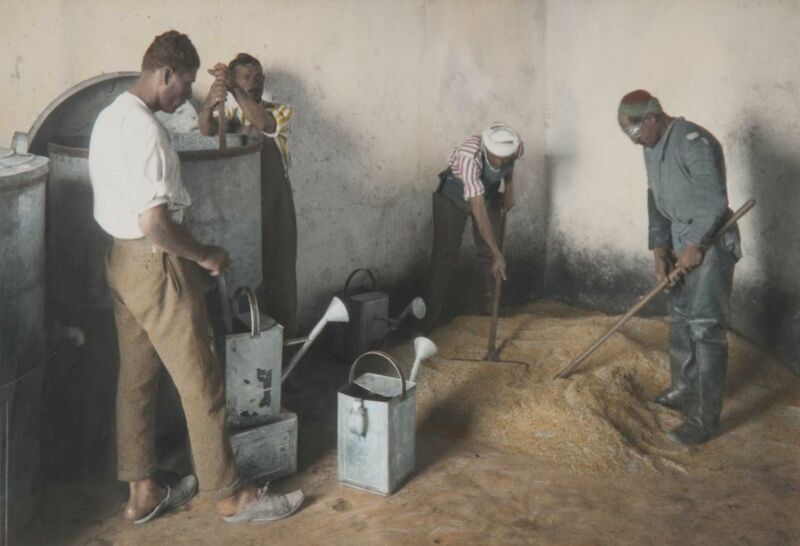 They took thousands of nitrate negatives (a kind of celluloid) with them and they hid the heavy glass negatives in the basement of the YMCA building in Jerusalem. In 1966, Matson donated the collection to the Library of Congress and in 1973, representatives of the Library of Congress came to Jerusalem to take possession of the glass negatives. Unfortunately, many had been damaged when the basement was flooded a few years before. The collection was catalogued in the Library of Congress, and was listed under its donors’ name, as is customary. Thus, when the collection was delivered, it appeared as if Matson was responsible for the photography department’s body of work, including the footage from the German Kaiser’s visit, which was taken when he was eight. 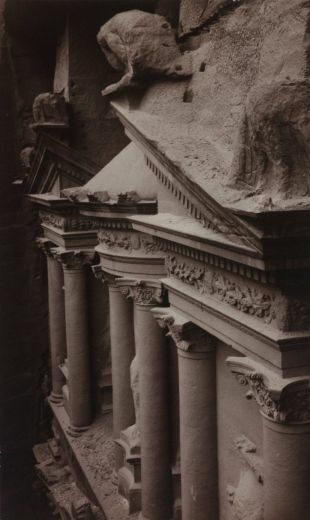 In interviews given while delivering the collection, Matson said that with the deteriorating state in Jerusalem, many negatives in the collection were lost. In the late 1990s, Swedish journalist Mia Grondahl asked the Library of Congress to change the photos’ catalogue and give colony photographers, chief among them Larsson, their due credit. Her petitions were ignored at first. It was only after Grondahl came to Washington and registered as a reader that she was able to locate the manager of the photography collections department, who agreed to discuss the matter with her. Twelve years ago, she published a book which included the photographs she had collected from the Larssons and other sources. The library’s database now makes the distinction between the work of the American Colony photography department and the work of the Matson Photo Service which inherited it. In addition to the negatives, the collection includes around 1,000 prints. “It’s clear the collection under Matson’s name does not reflect the body of work of a collective that operated for 34 years, and that it was created by 15 photographers,” Lev says. Parts of the collection are scattered around the world, and copies of the same photographs are kept in more than one collection. 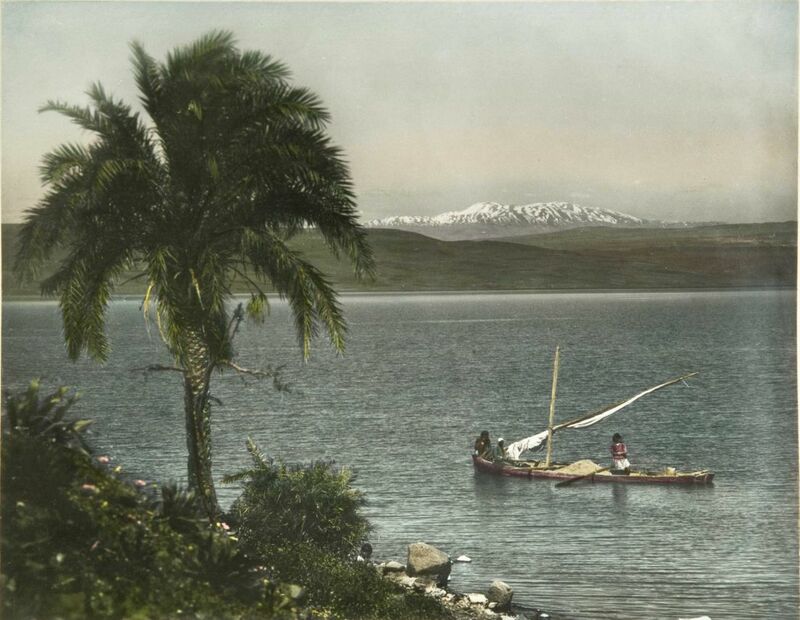 The Whiting Collection, donated to the Library of Congress a decade ago, includes 28 photo albums, most of which were taken by American Colony photographers. The national library in Jerusalem holds 20 albums. Research institute Yad Ben Zvi has is a collection of 2,000 glass slides, while the Jewish Historical Museum in Amsterdam keeps 1,200 hand-painted glass slides. The ethnographic museum in Stockholm holds an important collection of 264 hand-painted photographs purchased in 1916. 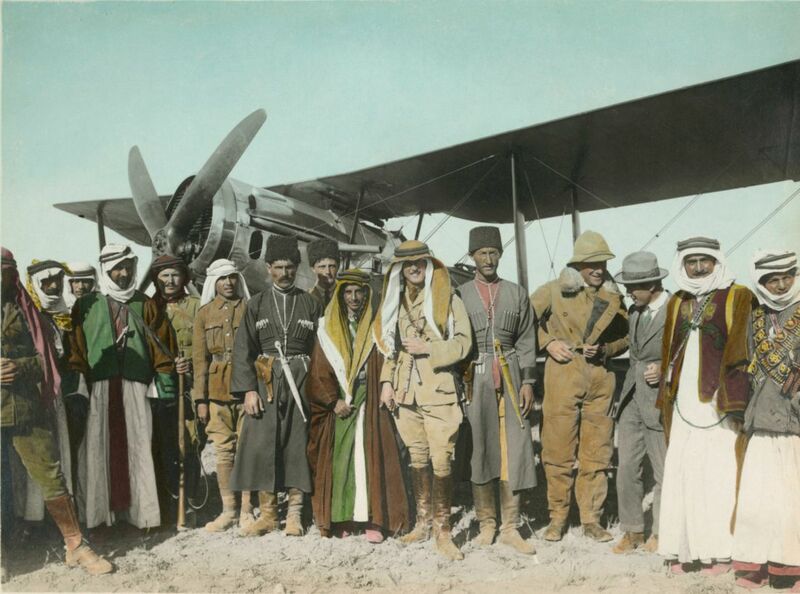 The Windsor Palace collection has the photo album of Jerusalem’s surrender to Allenby, and private collectors worldwide own albums, photographs, slides or additional negatives which originate from the collection of the photography department. Lev believes that additional footage from the American Colony collections will be uncovered in the future, and that each photograph encodes layers of complex historical information and real-time analysis. 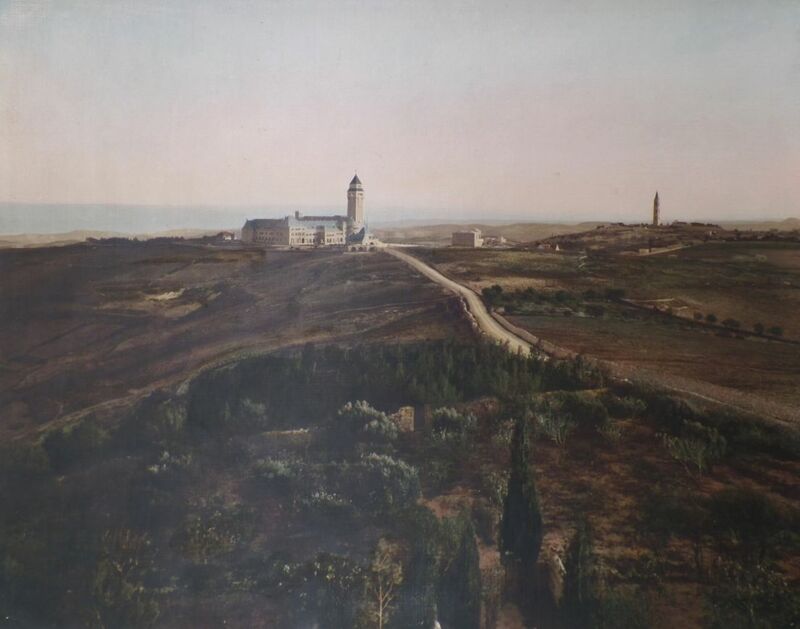 The German Kaiser’s visit, which marked the beginning of the photography department’s work, led to the creation of another project: the construction of the church-hospital complex Augusta Victoria, inspired by the design of German palaces, on Mount Scopus. 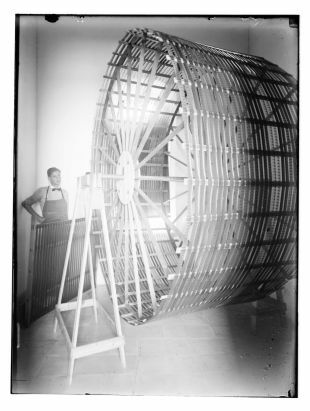 In 1914 shortly after the building works were completed, Larsson set out to photograph the immense structure. The magnificent, hand-painted photograph is kept in Sweden.